Use Flower Servant and it will remind you when to water, mist, fertilize or repot Chamaedorea elegans. Click here and try for free! 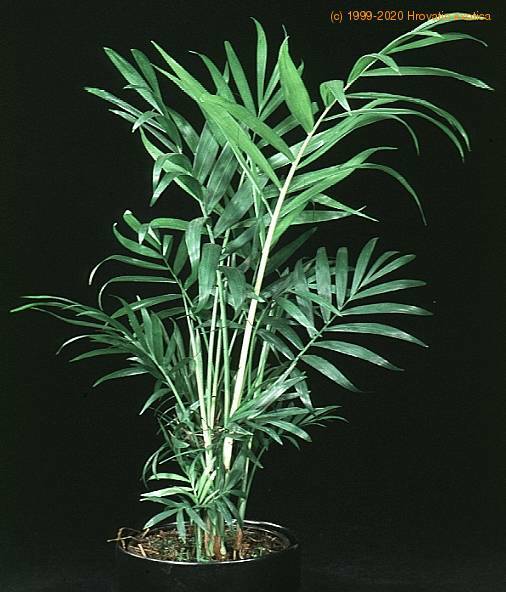 Very slow-growing fine leaved palm. Compact crown of shiny deep green, thin pinnate fronds. Great for indoors in lower lighting conditions. May grow up to 170 inches (4 m) outside, rarely over 105 inches (2,5 m) when grown as an indoor plant. Can be up to 30 inches (70 cm) width at the base when cultivated outside. Plant need medium to low light and tend to burn when placed in direct sunlight. Plants need a medium to high to thrive, though will grow ok with a lower humidity. Avoid growing this plant in a dry environment. The leaf tips turn brown if the plant is exposed to drafts, low humidity, or if overwatering. Use a well drained soil kept moderately moist. The plant can stay in one container until quite pot bound. Red spider mite can be a major pest of this plant.